Do you like to follow smart money buying and selling trends? We ran a screen with this idea in mind. We began by screening the biotech industry for stocks with high growth projections, with 5-year projected EPS growth rates above 15%. We then screened for those with bullish sentiment from institutional investors, with significant net institutional purchases over the last quarter representing at least 5% of share float. This indicates that institutional investors such as hedge fund managers and mutual fund managers expect these names to outperform into the future. For an interactive version of this chart, click on the image below. Analyst ratings sourced from Zacks Investment Research. Tool provided by Kapitall (kapitall.com). Do you think hedge funds are calling it right on these names? Use this list as a starting point for your own analysis. List sorted by net institutional purchases as a percent of share float. XOMA Corporation (NASDAQ:XOMA): Engages in the discovery, development, and manufacture of therapeutic antibodies to treat inflammatory, autoimmune, infectious, and oncological diseases. Market cap at $266.87M. Price at $3.85. 5-year projected EPS growth at 19.00%. Net institutional purchases in the current quarter at 29.4M shares, which represents about 71.48% of the company's float of 41.13M shares. Jazz Pharmaceuticals plc (NASDAQ:JAZZ): Develops and commercializes products for neurology and psychiatry primarily in the United States. Market cap at $2.55B. Price at $44.30. 5-year projected EPS growth at 25.68%. Net institutional purchases in the current quarter at 13.0M shares, which represents about 28.14% of the company's float of 46.20M shares. Pacific Biosciences of California, Inc. (NASDAQ:PACB): Develops, manufactures, and markets an integrated platform for genetic analysis. Market cap at $126.72M. Price at $2.17. 5-year projected EPS growth at 30.00%. Net institutional purchases in the current quarter at 5.5M shares, which represents about 17.27% of the company's float of 31.85M shares. Amylin Pharmaceuticals, Inc. (AMLN): Engages in the discovery, development, and commercialization of drug candidates for the treatment of diabetes, obesity, and other diseases. Market cap at $5.03B. Price at $30.77. 5-year projected EPS growth at 63.60%. Net institutional purchases in the current quarter at 17.9M shares, which represents about 12.12% of the company's float of 147.63M shares. Corcept Therapeutics Incorporated (NASDAQ:CORT): Engages in the discovery and development of drugs for the treatment of severe metabolic and psychiatric disorders. Market cap at $319.20M. Price at $4.48. 5-year projected EPS growth at 30.00%. Net institutional purchases in the current quarter at 5.5M shares, which represents about 10.99% of the company's float of 50.04M shares. Santarus, Inc. (NASDAQ:SNTS): Engages in acquiring, developing, and commercializing proprietary products that address the needs of patients treated by physician specialists. Market cap at $454.55M. Price at $7.24. 5-year projected EPS growth at 20.00%. Net institutional purchases in the current quarter at 3.9M shares, which represents about 9.79% of the company's float of 39.82M shares. Affymax, Inc. (OTC:AFFY): Engages in the development of drugs for the treatment of serious and life-threatening conditions. Market cap at $439.10M. Price at $11.85. 5-year projected EPS growth at 27.50%. Net institutional purchases in the current quarter at 2.7M shares, which represents about 8.77% of the company's float of 30.80M shares. Ariad Pharmaceuticals Inc. (NASDAQ:ARIA): Focuses on the discovery, development, and commercialization of small-molecule drugs for the treatment of cancer. Market cap at $2.92B. Price at $16.98. 5-year projected EPS growth at 25.00%. Net institutional purchases in the current quarter at 9.7M shares, which represents about 6.4% of the company's float of 151.66M shares. Amyris, Inc. (NASDAQ:AMRS): Offers renewable compounds for a variety of markets. Market cap at $165.58M. Price at $3.48. 5-year projected EPS growth at 21.00%. Net institutional purchases in the current quarter at 1.3M shares, which represents about 6.3% of the company's float of 20.64M shares. Sequenom Inc. (NASDAQ:SQNM): Provides products, services, diagnostic testing, applications, and genetic analysis products that translate the results of genomic science into solutions for biomedical research, translational research, molecular medicine applications, and agricultural and livestock research. Market cap at $435.25M. Price at $3.70. 5-year projected EPS growth at 27.50%. Net institutional purchases in the current quarter at 5.8M shares, which represents about 5.47% of the company's float of 105.98M shares. 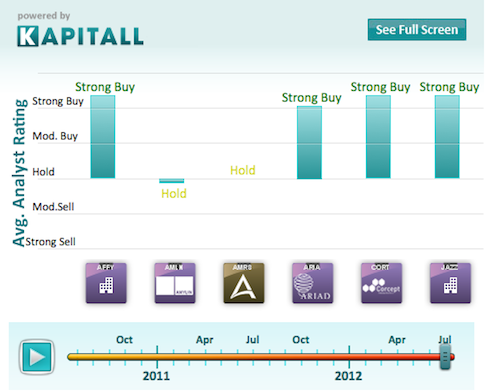 *Institutional data sourced from Fidelity, all other data sourced from Finviz.